This time Todd Rowland of Alderac Entertainment Group is my guest on Go Forth And Game. Todd is the Senior Brand Manager for AEG and he and I talk about his gaming and what AEG has going on. Tom: Todd, thanks for being my guest on Go Forth And Game. How did you get into gaming? Tom: How did you got involved with AEG? TR: I was a big L5R player, very involved in the community, playtest for the CCG, etc. After a while I did get my resume to John, who after several months contacted me and offered me the chance to manage the Warlord CCG, which AEG published at the time. Luckily my wife was supportive of a move across the country and I went for it. That was about eight years ago. Tom: So Todd, you’re the Senior Brand Manager for Alderac Entertainment Group. What does a Senior Brand Manager do? TR: Well, Senior Brand Manager is mostly an honorary I suppose, due to the fact I’m the one who’s been at AEG the longest in this position! Essentially for us a Brand Manager is a product manager who also oversees marketing and various other aspects of the product. We define our various projects, such as determining the theme, components, style, etc. We coordinate with the designers, playtest, artists, and graphic designers. I try to assemble the best talent I can to make the product as good as it can be. So really if a product turns out to be good, its more the talents of those working on it, I just brought them all together! I was also made the Director of Marketing for AEG, so I’m in charge of making sure all the proper messages for our games get out to the public. I help the other brand managers craft their messages, advertisements, etc. I do a lot of graphics work for booth displays, ads, etc. Tom: So you’re the guy who keeps things rolling. AEG has quite a few board and card games. Run them down for me. Legend of the Five Rings, which is our main project. It’s the second longest running CCG on the market. L5R is known for its immersive story and incredibly involved community. Players impact the story not only in tournaments, but also through their involvement in the online community, charity, and other means. Thunderstone was our first deckbuilding game, and has been a great success for the company. Thunderstone Advance has taken the game to a new level and we’re extremely happy with the reception it has had among gamers. Nightfall was our chance to do something new in deckbuilding and introduce real direct competition and player interaction. 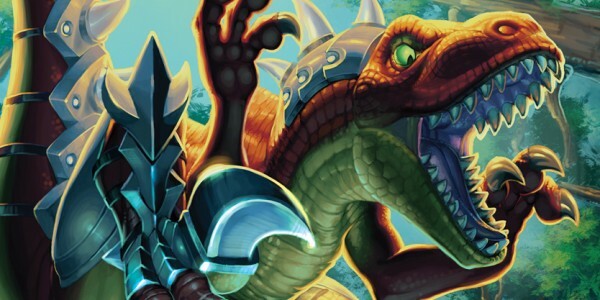 Our background in CCGs made us want to make a game that was more aggressive. Nightfall is also our first iOS game release with Playdek, and it has been a big hit. Ninja was our first board game set in the L5R universe, a slice-of-life game showing a single night in a Lion castle, as a Scorpion Clan ninja attempts to infiltrate. If you like hidden movement games this is a great one. The Legend of the Five Rings line also is in its 4th Edition of its role-playing game, and it too has been a big hit for us, we can barely keep the core book in stock. If you want a roleplaying game that challenges your conventions, this is one for you. It’s not all about killing ogres and taking swords, its about serving your lords honorably, and living by a strict cultural code at the same time as being a deadly warrior. We also have a lot of games in our back catalog, including Straw, Abandon Ship, Monkey Lab, The World’s Largest Dungeon, 7th Sea, and more. Tom: I’ve played Nightfall and enjoyed it. I found the chaining mechanic really intriguing. I need to play it some more. Thunderstone is fun though I haven’t played Advanced yet. I need to find someone who has it so I can try it out. That’s an impressive list. Other than L5R, what has been AEG’s biggest hit? TR: At the moment, Thunderstone has been our biggest game hit behind L5R. We were extremely pleased with how the gaming community took to crushing monsters more efficiently than their opponents! We have big plans for the Thunderstone Advance line. Interestingly a lot of older AEG fans may recognize that some Thunderstone art came from our previous CGG “Warlord.” What is funny is that at the time, Warlord was our biggest other game, rivaling the sales of L5R for a time. Tom: It kind of was your breakout game with regards to board/card games. How did you catch it? TR: We knew that we wanted to get into deckbuilding. It was a natural fit for us given our history with CCGs. It’s just the kind of game that appeals to us. We decided we wanted a deckbuilding game with a very strong theme, where you felt like you were really accomplishing something in fighting the monsters. 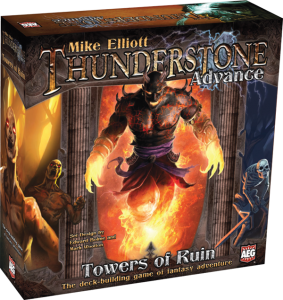 We contacted Mike Elliot, talked with him about our goals, and soon enough Thunderstone came along. 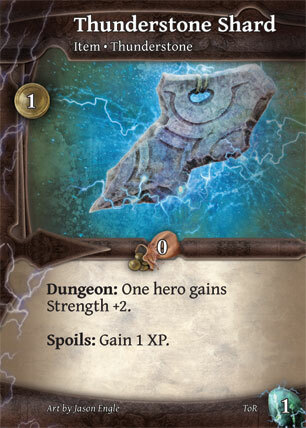 Tom: How does Thunderstone: Advance change the base game? 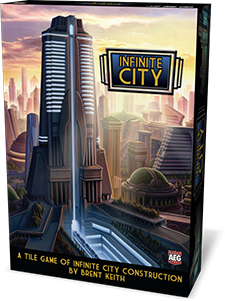 TR: If anything it greatly streamlines the rules of the game, while bringing in some fresh new additions that can get people into the game much faster. We find that a lot of games spend time building up to the action, and people seem to prefer getting right into it. We made a similar change to L5R a few years ago, essentially removing an entire turn of build up to get to the action. It was one of the most well liked changes in the game’s history. Tom: AEG has some pretty interesting games on the way. First let’s talk about Smash-Up. AEG’s been posting art from the cards and it looks really fun. Tell me about it. TR: Smash Up is one that we are really excited to bring to the market. We’ve had a blast developing the game with designer Paul Peterson. The design he brought was simple yet very engaging, with a ton of replay value. It was a blast coming up with the groups for the game, getting cool art for them, and as you’ll see soon we had a great time even writing the rulebook. Smash Up is not a deckbuilding game, but rather you take two decks at the start of the game, shuffle them together, and play. We’re calling it shufflebuilding. You play the game smashing bases with your minions, and the first to 15 points wins. Each faction brings its own mechanical focus, such as Pirates being most movement, Zombies for recursion, and Dinosaurs (with lasers) being massive power minions. Combine them into various decks that play in completely different ways. Tom: Dinosaurs with lasers – how can you not love that? It looks and sounds like a whole lot of fun and I can’t wait to play it. I’m very interested in the three games you’ve announced in the City of Tempest series. Go over those please. TR: Tempest is a shared-world game line, featuring various designers who tell the story of this dangerous city through their games. Courtier is the “first” in the series, being a prologue of sorts that tells how the royalty fell from power and the Senate took over. Designed by Philip duBarry, the game involves influencing various court members to complete petitions. Complete the most before the Queen is arrested and you win. 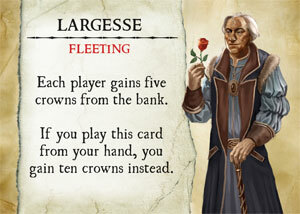 Next up is Mercante, which shows the rising merchant class. Ships come into and out of the harbor, while the various merchant houses fight to buy and sell the goods onboard, fulfilling contracts to win senatorial support for their merchant houses. At the end of the game, the player with the most value of favors owed to him by the Senate wins. Mercante is designed by Jeff Tidball. The third in the initial releases is Dominare by jim pinto. Dominare moves the camera out to the overall city, and the various conspiracies that are forming to gain control of the city. By amassing a group of agents from all walks of life (politics, commoners, merchants, church, etc.) you can spread the most influence among the city and dominate Tempest. More games in the Tempest world will follow in 2013. Tom: They sound like AEG’s foray into the euro arena. I’m really interested in all three of those. Any scoops for me? TR: Probably the most interesting thing we’re working on right now is a system that will let various designers, both known and up-and-coming, submit their game concepts to Tempest and continue the story of the world, as well as of course having their games published in this high-profile line. So if you have a game you’ve been working on with your friends, keep an eye on our Tempest web site for information on how you can submit it for consideration in Tempest. Tom: Wow! That sounds really awesome. So, fledgling game designers, get your games polished and check out the AEG website for more information on Tempest submissions. Thank you Todd for taking time to be my guest on Go Forth And Game. 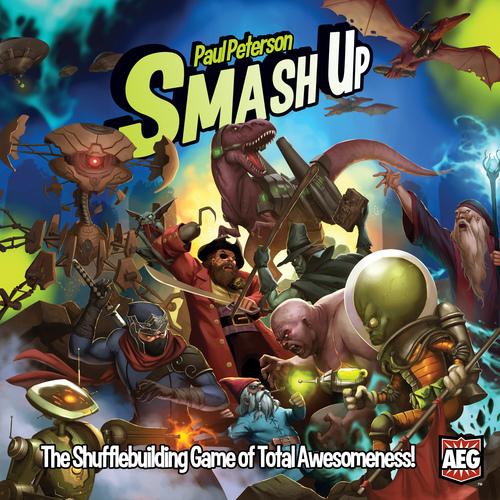 I’m excited to learn about Smash Up and the Tempest games and learning about AEG and the new games you are bringing to us soon. Thanks for joining me for another interview, readers. Keep checking. There are more interviews on the way as well as a peek into The Laboratory.